Los Angeles based Diagnostic Automation/Cortez Diagnostics, Inc., your online source for drug testing supplies and rapid diagnostic tests, offers a 5 Panel Drug Test for any combination drugs: (AMP) Amphetamine drug test, (COC) Cocaine drug test, (THC) Marijuana drug test, (MOR) Morphine drug test, and Phencyclidine (PCP) drug test.Â This 5 panel drug testing kit is designed for qualitative determination of drug substances in human urine specimen. The five panel -(AMP) Amphetamine drug test, (COC) Cocaine drug test, (THC) Marijuana drug test, (MOR) Morphine drug test device is based on the principle of specific immunochemical reaction between antibodies and antigens to analyze particular compounds in human urine specimen. The assay relies on the competition for binding antibody between drug conjugate and free drug which may be present in the urine specimen being tested.Â Â When the Amphetamine (AMP), Cocaine (COC), Morphine, (MOR), Marijuana (THC), or Phencyclidine (PCP) drug is present in the urine specimen, it competes with drug conjugate for the limited amount of antibody-dye conjugate. When the amount of the Amphetamine (AMP), Cocaine (COC), Morphine, (MOR), Marijuana (THC), or Phencyclidine (PCP) drug is equal or more than the cut-off, it will prevent the binding of drug conjugate to the antibody. Therefore, a positive urine specimen on the 5 panel drug test - (AMP) Amphetamine drug test, (COC) Cocaine drug test, (THC) Marijuana drug test, (MOR) Morphine drug test, and Phencyclidine (PCP) Drug Test will not show a colored band on the test line zone, indicating a positive result, while the presence of a colored band indicates a negative result.Â Â An internal control line is present in the test window to work as procedural control. This colored band should always appear on the control line zone if the 5 panel drug test - (AMP) Amphetamine drug test, (COC) Cocaine drug test, (THC) Marijuana drug test, (MOR) Morphine drug test, and Phencyclidine (PCP) drug testing device is stored in good condition and the 5 panel drug test - (AMP) Amphetamine drug test, (COC) Cocaine drug test, (THC) Marijuana drug test, (MOR) Morphine drug test, and Phencyclidine (PCP) Drug Test is performed appropriately. Amphetamines are a class of potent sympathominetic agents with therapeutic applications. The most common amphetamine drugs are d-amphetamine and d,l-amphetamine. Amphetamine drugs are metabolized by a number of pathways. In general, acid urine promotes excretion whereas alkaline urine retards it. In 24 hours, approximately 79% of the amphetamine drug dose is excreted in acid urine and about 45% in alkaline urine. Typically, about 20% of the amphetamine drug is excreted as unchanged amphetamine. Unchanged amphetamine can be detected up to 1 to 2 days after use.Â Â The cutoff for this 5 panel amphetamine drug test is 1000 ng/ml of d-amphetamine. Cocaine (COC) is derived from the leaves of the cocoa plant.Â Â The cocaine drug is used by smoking, intravenous, intransal or oral administration and excreted in the urine primarily as benzoylecgonine in a short period. Benzoylecgonine has a biological half-life of 5 to 8 hours, which is much longer than that of the cocaine drug (0.5 to 1.5 hours), and can be generally detected for 12 to 72 hours after cocaine drug use or exposure.Â Â Â Â The cutoff level for this 5 panel cocaine drug test is 300 ng/ml of benzoylecgonine. The agents of the Marijuana Drug (THC) that cause various biological effects in humans are called cannabinoid.Â Â Ã¢Â�Â£9-THC is the primary active ingredient in cannabinoids. 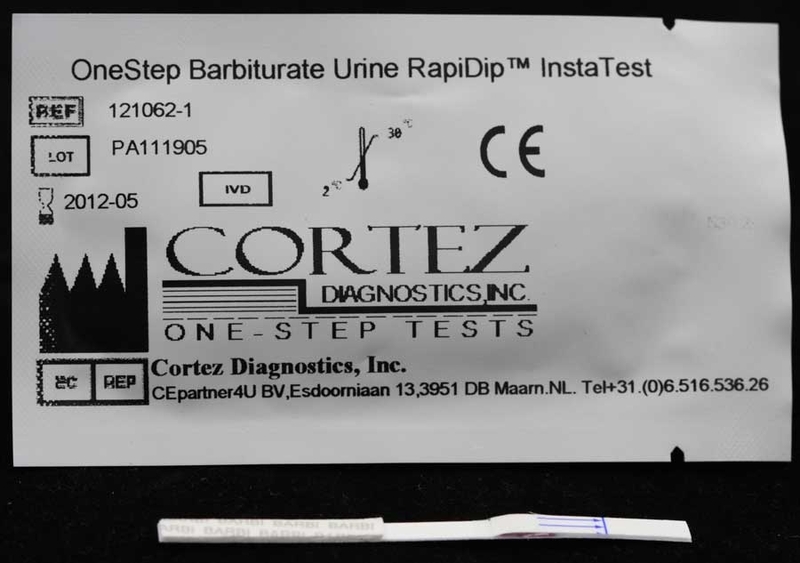 The main metabolite excreted in the urine is 11-nor-Ã¢Â�Â£9-THC-9-COOH, which are found within hours of exposure and remain detectable in the urine for 3-10 days after smoking.Â Â The cutoff level for this 5 panel marijuana drug test is 50 ng/ml of 11-nor-D9-THC-9-COOH. The Morphine drug (MOR) is an opioid analgesic, the principal and most active alkaloid of opium.Â Â The morphine drug is excreted unmetabolized and is the marker metabolic product of opiate drugs.Â Â The morphine drug and the drug morphine glucuronide are detectable in urine for several days after opiate drug dose.Â Â The cutoff level for this 5 panel morphine drug test is 300 ng/ml of morphine. Phencyclidine, commonly known as PCP, is a hallucinogen drug which interacts with dopamine, cholinergic and adrenergic systems. The PCP drug is metabolized via hydroxylation, oxidation, and conjugation with glucuronic acid in the liver. About 10% of the PCP drug dose is excreted in urine as unchanged PCP drug.Â Â For chronic users, the PCP drug can be detected in the urine for 7 to 8 days after drug ingestion.Â Â The cutoff level for this 5 panel PCP drug test is 25 ng/ml of phencyclidine. The five panel drug test kit provides only a preliminary analytical test result. A more specific alternative chemical method must be used in order to obtain a confirmed analytical result. Gas chromatography/ mass spectrometry (GC/MS) has been established as the preferred confirmatory method by the Substance Abuse Mental Health Services Administration (SAMHSA). Clinical consideration and professional judgment should be applied to any drug of abuse test result, particularly when preliminary positive results are indicated. 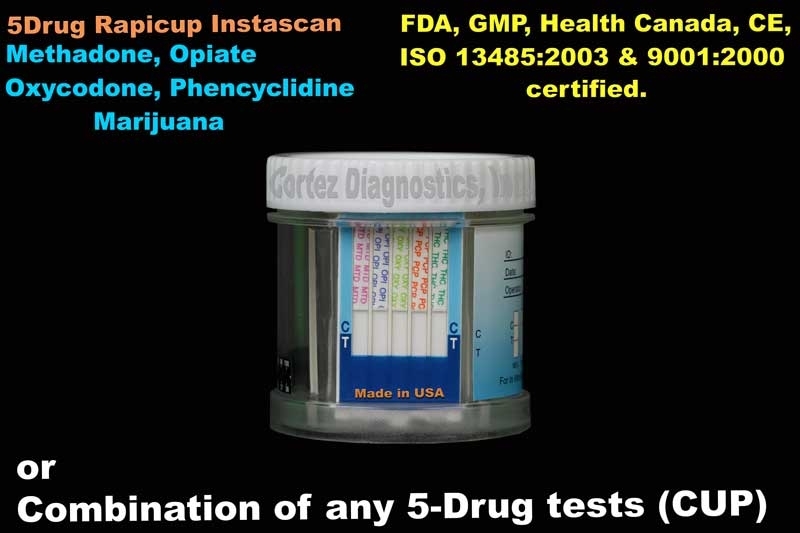 The optional built-in Adulteration Test is for validation of urine specimenâ€™s integrity and must not be used for In Vitro diagnostic use.Â Â For customized cutoff levels for any multi panel drug tests, please contact Customer Service.Â Â This 5 panel drug test - (AMP) Amphetamine drug test, (COC) Cocaine drug test, (THC) Marijuana drug test, (MOR) Morphine drug test, and Phencyclidine (PCP) Drug Test is available in cassette, strip, or cup format. 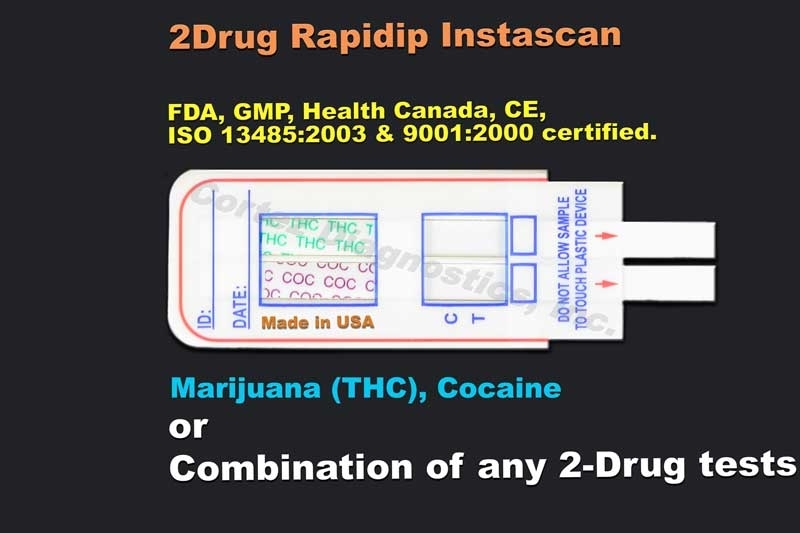 e drug test, (COC) Cocaine drug test, (THC) Marijuana drug test, (MOR) Morphine drug test device is based on the principle of specific immunochemical reaction between antibodies and antigens to analyze particular compounds in human urine specimen. The assay relies on the competition for binding antibody between drug conjugate and free drug which may be present in the urine specimen being tested. When the Amphetamine (AMP), Cocaine (COC), Morphine, (MOR), Marijuana (THC), or Phencyclidine (PCP) drug is present in the urine specimen, it competes with drug conjugate for the limited amount of antibody-dye conjugate. When the amount of the Amphetamine (AMP), Cocaine (COC), Morphine, (MOR), Marijuana (THC), or Phencyclidine (PCP) drug is equal or more than the cut-off, it will prevent the binding of drug conjugate to the antibody. Therefore, a positive urine specimen on the 5 panel drug test - (AMP) Amphetamine drug test, (COC) Cocaine drug test, (THC) Marijuana drug test, (MOR) Morphine drug test, and Phencyclidine (PCP) Drug Test will not show a colored band on the test line zone, indicating a positive result, while the presence of a colored band indicates a negative result. An internal control line is present in the test window to work as procedural control. This colored band should always appear on the control line zone if the 5 panel drug test - (AMP) Amphetamine drug test, (COC) Cocaine drug test, (THC) Marijuana drug test, (MOR) Morphine drug test, and Phencyclidine (PCP) drug testing device is stored in good condition and the 5 panel drug test - (AMP) Amphetamine drug test, (COC) Cocaine drug test, (THC) Marijuana drug test, (MOR) Morphine drug test, and Phencyclidine (PCP) Drug Test is performed appropriately. Amphetamines are a class of potent sympathominetic agents with therapeutic applications. The most common amphetamine drugs are d-amphetamine and d,l-amphetamine. Amphetamine drugs are metabolized by a number of pathways. In general, acid urine promotes excretion whereas alkaline urine retards it. In 24 hours, approximately 79% of the amphetamine drug dose is excreted in acid urine and about 45% in alkaline urine. Typically, about 20% of the amphetamine drug is excreted as unchanged amphetamine. Unchanged amphetamine can be detected up to 1 to 2 days after use. The cutoff for this 5 panel amphetamine drug test is 1000 ng/ml of d-amphetamine. Cocaine (COC) is derived from the leaves of the cocoa plant. The cocaine drug is used by smoking, intravenous, intransal or oral administration and excreted in the urine primarily as benzoylecgonine in a short period. Benzoylecgonine has a biological half-life of 5 to 8 hours, which is much longer than that of the cocaine drug (0.5 to 1.5 hours), and can be generally detected for 12 to 72 hours after cocaine drug use or exposure. The cutoff level for this 5 panel cocaine drug test is 300 ng/ml of benzoylecgonine. The agents of the Marijuana Drug (THC) that cause various biological effects in humans are called cannabinoid. Ã¢Â�Â£9-THC is the primary active ingredient in cannabinoids. The main metabolite excreted in the urine is 11-nor-Ã¢Â�Â£9-THC-9-COOH, which are found within hours of exposure and remain detectable in the urine for 3-10 days after smoking. The cutoff level for this 5 panel marijuana drug test is 50 ng/ml of 11-nor-D9-THC-9-COOH. The Morphine drug (MOR) is an opioid analgesic, the principal and most active alkaloid of opium. The morphine drug is excreted unmetabolized and is the marker metabolic product of opiate drugs. The morphine drug and the drug morphine glucuronide are detectable in urine for several days after opiate drug dose. The cutoff level for this 5 panel morphine drug test is 300 ng/ml of morphine. Phencyclidine, commonly known as PCP, is a hallucinogen drug which interacts with dopamine, cholinergic and adrenergic systems. The PCP drug is metabolized via hydroxylation, oxidation, and conjugation with glucuronic acid in the liver. About 10% of the PCP drug dose is excreted in urine as unchanged PCP drug. For chronic users, the PCP drug can be detected in the urine for 7 to 8 days after drug ingestion. The cutoff level for this 5 panel PCP drug test is 25 ng/ml of phencyclidine. The five panel drug test kit provides only a preliminary analytical test result. A more specific alternative chemical method must be used in order to obtain a confirmed analytical result. Gas chromatography/ mass spectrometry (GC/MS) has been established as the preferred confirmatory method by the Substance Abuse Mental Health Services Administration (SAMHSA). Clinical consideration and professional judgment should be applied to any drug of abuse test result, particularly when preliminary positive results are indicated. The optional built-in Adulteration Test is for validation of urine specimenâ€™s integrity and must not be used for In Vitro diagnostic use. For customized cutoff levels for any multi panel drug tests, please contact Customer Service. 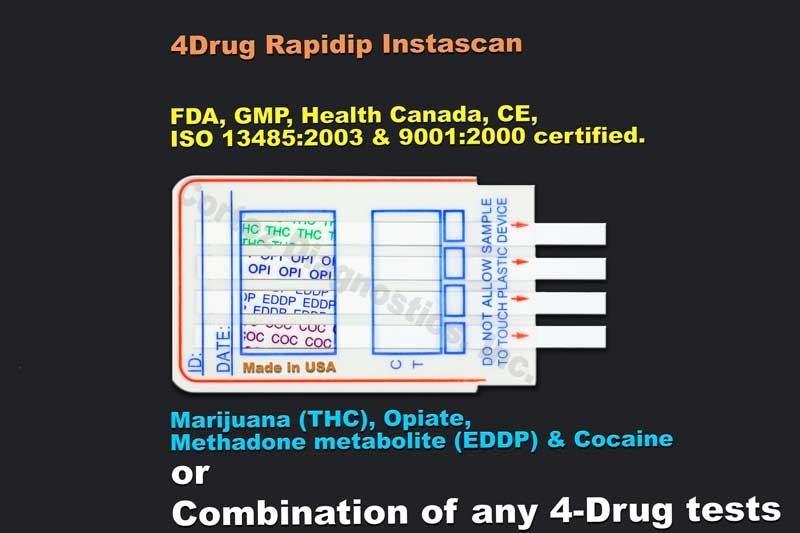 This 5 panel drug test - (AMP) Amphetamine drug test, (COC) Cocaine drug test, (THC) Marijuana drug test, (MOR) Morphine drug test, and Phencyclidine (PCP) Drug Test is available in cassette, strip, or cup format.